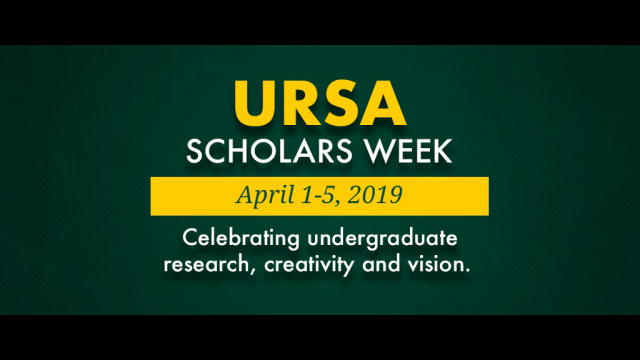 WACO, Texas (April 2, 2019) – Research and creative works from hundreds of Baylor University students will be on display April 1-5, during the annual URSA Scholars Week, a celebration of Undergraduate Research and Scholarly Achievement (URSA). More than 400 students representing 26 different academic disciplines will present the results of independent research and scholarly projects completed in the past year under the guidance of faculty mentors. “One of the most important steps in research is disseminating the results of your work,” said Nathan Elkins, Ph.D., director of URSA and associate professor of art history (Greek and Roman) in Baylor’s College of Arts & Sciences. Student researchers will give platform presentations in the Bill Daniel Student Center from 1:30 to 3 p.m. and 3:30 to 5 p.m. Monday and Tuesday, April 1 and 2. Poster sessions at the Baylor Sciences Building will take place Monday through Wednesday with posters on display throughout each day and with students on hand to discuss their projects at selected times. Scholars Week participants whose presentations are judged most outstanding by a panel of faculty and staff will be recognized at an awards reception at noon Friday, April 5, in Barfield Drawing Room in the BDSC. For a detailed schedule that includes room/poster locations and presentation topics, download the Scholars Week program at www.baylor.edu/ursa/scholars-week. Founded in 2007, the Undergraduate Research and Scholarly Achievement (URSA) initiative at Baylor welcomes all undergraduates, from freshman to senior, to consider maximizing their education through a variety of research and scholarly activities found both within the classroom and beyond. The program awards competitive grants to faculty members to be used to support undergraduate students’ research and scholarship projects under their mentorship. Each spring the students present their findings via poster and platform presentations during Scholars Week. In 2018, 450 students representing more than 30 academic departments made presentations of URSA-sponsored projects during Scholars Week. URSA Scholars Week is sponsored by the Baylor Office of Vice Provost for Research. And all events are free and open to the public. The Office of the Vice Provost for Research (OVPR) supports faculty members from all academic units in their research and scholarship. The office provides pre- and post-award services for grants and contracts, facilitates Industry partnerships and collaborative agreements with external entities, manages compliance oversight, provides assistance with intellectual property and technology transfer, and offers marketing and communication support for Baylor research. The OVPR also manages and operates the Baylor Research and Innovation Collaborative (BRIC), a three-story, 330,000-square-foot facility focused on interdisciplinary/international research, industry/university collaborations, business incubation/acceleration/commercialization, advanced workforce training, and STEM educational research and outreach. For more information, please visit www.baylor.edu/research or www.baylor.edu/bric.